The collapse of oil prices since 2014 has brought economic diversification back to the top of policymakers’ agenda in many oil-exporting countries. The standard policy advice to break oil dependence is to pursue structural reforms such as providing an enabling business environment for private sector growth, macroeconomic stability, and supportive regulatory and institutional framework (e.g. Collier and Goderis 2007, van der Ploeg 2011). Our recent book sheds light on what constitutes true economic diversification and the role of the state in achieving it (Cherif et al. 2016). The book emphasises that the way the state intervenes is important, and both incentives and market forces have their role to play. The drop in oil prices has raised the spectre of a return of the slump of the 1980s-1990s in oil-exporting countries. Back then, with oil prices staying low for two decades, living standards fell, unemployment increased, and public debt skyrocketed. Oil exporters went through a long recessionary cycle – in terms of consumption per capita – that lasted about three decades compared to one decade for the Great Depression of the 1930s. 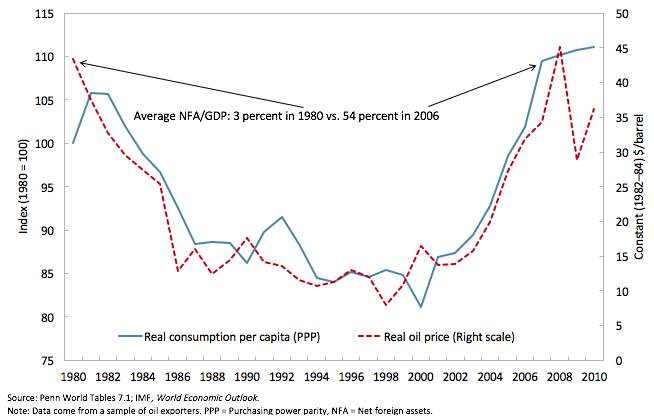 Consumption per capita on average fell by about 20% from the 1980 peak, only to return to this level by the late 2000s as oil prices recovered (Figure 1).1 Over the last 30 years, most oil exporters have seen poor performance of productivity growth and witnessed relative income decline (Figure 2). In other words, oil-dependent countries, in general, fell behind in international income rankings. Again, this time low oil prices could persist. The recent rise of renewable energy and electric cars, reinforced by global commitments to fight climate change, suggests the transition away from fossil energy could be accelerating. Whether oil prices rise again or not, oil exporters must change their prevailing economic model – which is based mainly on channelling oil income into the non-tradable sector and importing tradables – to a diversified and innovative economy. Declining productivity and relative income stagnation in many oil exporting countries can be explained by the lack of diversified and sophisticated exports. In fact, output composition is a misleading indicator of diversification, and ultimately oil dependence, because it can be quite detached from the extent to which an economy can churn out tradable goods and services. Non-oil output is mostly driven by government spending, which in turn is dependent on the revenues from the oil sector. The comparison of Bahrain and Singapore offers a stark example of the distinction between export diversification and output diversification. The output compositions of the two countries are comparable overall, but exports in Bahrain are almost exclusively concentrated in oil and metals, vastly different from the diversified export base of Singapore (Figures 3 and 4). Oil exporters, the majority of which have upgraded their infrastructure during the oil boom, must now turn their attention towards creating a dynamic export sector to diversify their economies. Just as the state played a key role in infrastructure, it has an important role in achieving diversification. Standard growth policy prescriptions such as macroeconomic stability, minimum state intervention, and an enabling environment conducive to investment in both physical and human capital may not be sufficient, as they mostly tackle ‘government failures’ and do not address ‘market failures’ (Rodrik 2005). The countries of the Gulf Cooperation Council (GCC) provide a quasi-natural experiment, illustrating the importance of market failures. 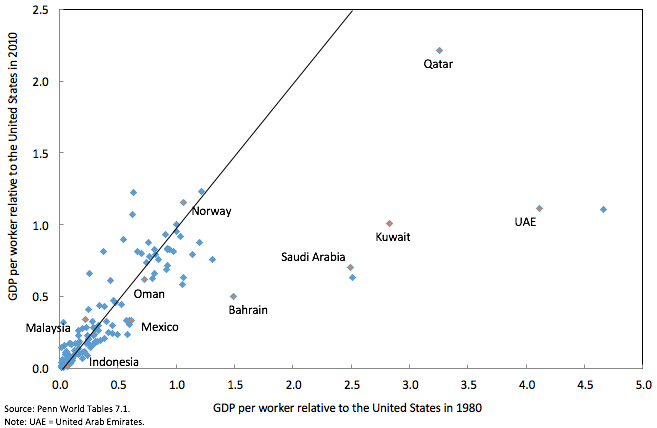 The GCC countries have managed to achieve relatively high rankings along many standard dimensions of binding constraints on growth – for instance, availability of quality infrastructure, relatively good business environment, free mobility of capital and labour including skilled labour, and low tariffs and taxes (Figure 5). Yet, productivity growth has been anaemic and even negative for the past decades and the non-oil tradable sector has barely developed (Cherif and Hasanov 2016). Norway provides an additional stark example of market failures. Government failures are basically non-existent there, in particular in comparison with other oil exporters. 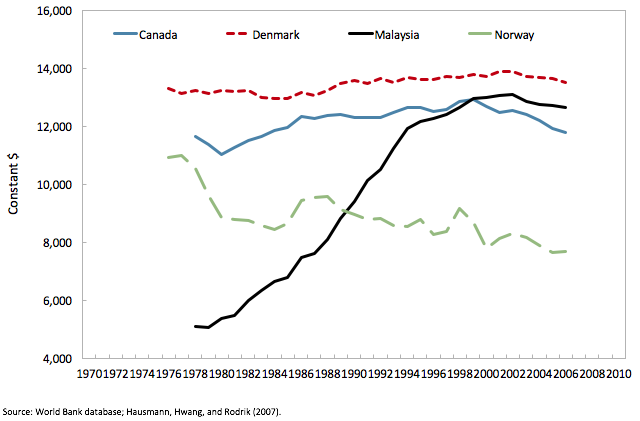 Nonetheless, Norway still fell prey to the Dutch disease. In 2012, manufacturing hourly wages were the highest in the world and about double those of the US or Japan, according to the US Bureau of Labor Statistics. Unit labour costs increased by 50% in the 2000s, whereas they declined in Germany and Sweden. The measure of export sophistication shows a declining trend for Norway as opposed to that for Denmark, a comparator country (Figure 6). This suggests that trying to reach Norway’s level of institutional quality and openness would certainly not be enough to develop the tradable sector. Market failures are an important impediment to creating a dynamic export sector, and ultimately sustained growth, in the GCC countries and other oil exporters. Entrepreneurs and firms do not enter sophisticated industries in sufficient numbers to make these industries viable as non-tradable industries are less risky and more profitable. In turn, this leads to a less than desirable allocation of resources from a national perspective in high-productivity sectors and results in lower growth over time. This constitutes a market failure, and the state must intervene to correct it. True diversification focuses on export-orientation in sophisticated industries, that is, industries conducive to productivity gains and spillovers, while emphasising the development of domestic capabilities and enforcing accountability. The interventionist approach of the 1970s and 1980s in many countries exposed the limits of import-substitution policies that impeded competition and enabled rent-seeking. In contrast, export-oriented policies such as those in East Asia forced firms to compete on international markets and provided valuable market signals for the state to gauge performance and enforce accountability. The focus on sophisticated industries in the export sector is critical as these industries lead to productivity gains with linkages and spillovers to the rest of the economy. Norway’s policies to develop an oil and gas suppliers’ cluster in the 1970s represent an interesting case study of state intervention to tackle market failures. The government intervened directly in the procurement of oil operators to develop oil suppliers’ cluster, required foreign operators to develop the competencies of local suppliers, and imposed a minimum of 50% of research and development spending to develop an oil field to take place in Norwegian entities (Heum 2008, Leskinen et al. 2012). The state continued to support suppliers over the years to encourage firms to internationalise their activity. Eventually, the suppliers’ cluster became successful, spanning a large array of high value-added industries. Ultimately, to correct market failures and create a dynamic export sector, the state needs to realign the incentive structure for firms and workers. It needs to help firms look beyond the confines of domestic markets and seek new export opportunities. Country experiences suggests that successful strategies mix vertical diversification (in specific sectors) to create linkages in existing industries and horizontal diversification (across sectors) beyond comparative advantage, with an emphasis on exports and technological upgrading. 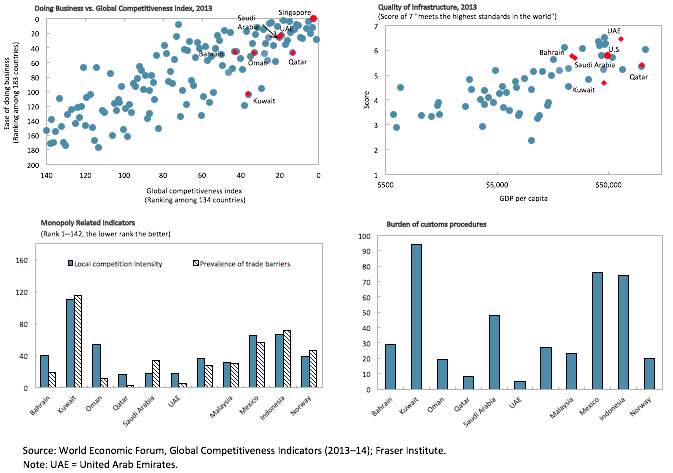 The state intervention should focus on developing specific sectors rather than picking firms, preserving competition, and ‘creative destruction.’ In other words, as the late Sanjaya Lall argued, state policies should not be about ‘picking winners’; rather, they should be about helping ‘create winners’. These policies, however, cannot succeed if they are not accompanied by a strict accountability framework for industries and firms receiving support, as in Korea. In parallel, the state needs to encourage individuals to develop skills that are of value in the private sector, and in particular in sophisticated export industries. In many oil exporters, the expectation of securing a public sector job has discouraged workers from pursuing entrepreneurship and private sector employment. In such cases, such expectations need to be changed, and public sector wages and benefits – which private sector employers need to compete with – will have to be checked. In such cases, firm limits on public employment and wages need to be placed. In addition, social safety nets such as unemployment insurance and job search support should be made available. Training vouchers could be used for retraining and skills acquisition (Callen et al. 2014). What countries that succeeded at diversifying their economies have in common is what we refer to as the leading hand of the state. That is, Adam Smith’s invisible hand of the market and Albert Hirschman’s hiding hand principle give way to the leading hand of the state. The state needs to lead this diversification process by integrating public and private sectors to promote export-driven firms and human capital development specific to these industries. The leading hand could thus lead countries towards becoming innovation-driven economies. And even though this true diversification path is challenging, oil-exporting countries should use the opportunity of low oil prices to embark on this journey. Authors' note: The views expressed here are those of the authors and do not necessarily represent those of the institutions with which they are affiliated. Callen, T, R Cherif, F Hasanov, A Hegazy and P Khandelwal (2014) “Economic diversification in the GCC: Past, present, and future”, IMF Staff Discussion Notes 14/12, International Monetary Fund. Cherif, R, F Hasanov and M Zhu (eds) (2016) Breaking the oil spell: The Gulf Falcons’ path to diversification, Washington, DC: International Monetary Fund. Cherif, R and F Hasanov (2016) “Soaring of the Gulf Falcons: Diversification in the GCC oil exporters in seven propositions,” In Cherif, R, F Hasanov and M Zhu (eds) Breaking the oil spell: The Gulf Falcons’ path to diversification, Washington, DC: International Monetary Fund. Collier, P and B Goderis (2007) “Commodity prices, growth, and resource curse: Reconciling a conundrum,” CSAE WPS/2007-15, University of Oxford. Heum, Per (2008) “Local content development – Experiences from oil and gas activities in Norway,” SNF, Bergen. Leskinen, O, P K Bekken, H Razafinjatovo and M García (2012) “Norway oil and gas cluster: A story of achieving success through supplier development,” Harvard Business School. Rodrik, D (2005) “Growth strategies”, In P Aghion and S Durlauf (eds), Handbook of Economic Growth, chapter 14, 1(1): 967-1014.
van der Ploeg, F (2011) “Natural resources: Curse or blessing?” Journal of Economic Literature, 49(2): 366-420. Oil exporters’ sample: Algeria, Bahrain, Gabon, Libya, Nigeria, Oman, Saudi Arabia, Sudan, Syria, and Venezuela.